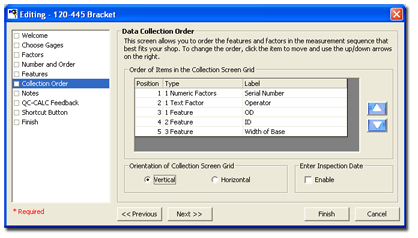 The spec plan wizard has been designed to be an easy tool for creating complete measurement (spec) plans in a step by step style. While there are many features that can be set, the following are a couple highlights. Spec plans can be saved and continued at a later time. This is a useful feature if you need to measure parts both before and after an operation. All you need to do is measure the part, then save and close the session. When the part is ready to be continued, simply resume the previous session for that part. 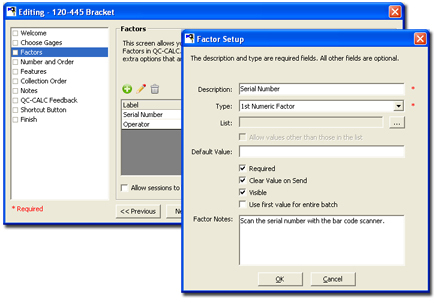 Parts can be selected based on date/time or by a unique factor such as serial number. You can optionally link your spec plan to external documents that contain work instructions or blue prints. When the inspector clicks the link, it automatically opens the document. Links support both regular Windows paths as well as HTTP paths for customers who have a web based document management system. Regardless as to how you set up the features and factors, you can change the order of their appearance during data collection. For instance, if you always want the factors to be entered before the measurements, you can simply move them to the top of the order. By default, the inspection date that is sent to QC-CALC is the date/time of the last measurement. There are options for the start time of the spec plan, the start time for each part (when first measurement is entered), the end time of the spec plan, or a user-entered date. 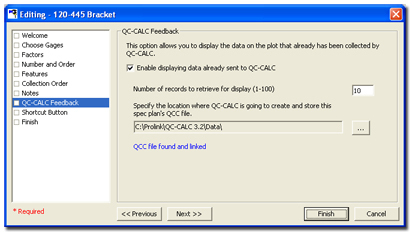 Spec plans can pull back measurements from QC-CALC that were already committed and display them in the run plot as black read-only points. This allows you to see the history of your features as you measure new parts.